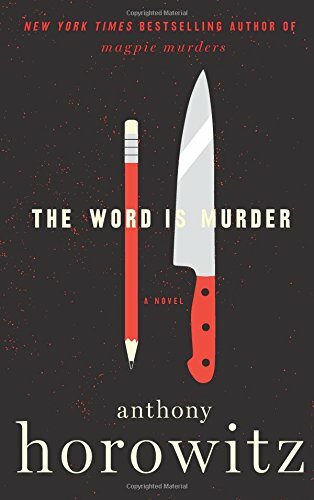 At first, the prolific British novelist and television screenwriter Anthony Horowitz demurs, or at least says he does in the novel The Word Is Murder, the debut outing in a projected series. A character named “Anthony Horowitz,” who is in most respects exactly like the real writer, agrees to assist the sleuth. The former police detective has been called in by the London Met to solve the murder of a wealthy matron strangled in her parlor—just hours after visiting an undertaker to plan her own funeral. David Hawthorne is a prickly bloke whom Horowitz has met while the ex-cop worked as a technical adviser on his 2011 legal drama Injustice, for British TV. Like Sherlock Holmes—no accident—Hawthorne is uncannily intuitive in the way good investigators tend to be. And, also like the famed pipe smoker, Hawthorne does consulting work on difficult cases for the police. Hawthorne proposes that Horowitz write a book about the case he is then working on, and that they split the advance and royalties 50-50. The book would comprise Horowitz’s words recording Hawthorne’s actions in solving the murder. At first Horowitz is reluctant, suggesting Hawthorne find a more suitable collaborator, a true crime writer. The two genres, crime fiction and true crime, resist hybridization, he says. But the proposal comes at a temptingly fortuitous time. Horowitz, both the author and the character, is available, having just sent off his first Sherlock Holmes reboot, The House of Silk, and with his television series, Foyle’s War, on hiatus. Once the premise is established, the narrative settles into more or less standard procedural rhythms, with some expert observations. Hawthorne points out to Horowitz, correctly, that few criminal masterminds commit murders. In most cases, killings grow out of impulse or compulsion. Their perpetrators are clueless or unconcerned about covering their tracks. And, like many police investigators, the detective disdains journalists. Well, no. In fiction, point of view trumps everything else, so the reader is actually press-ganged into identifying with Horowitz, which is not always easy. “It worries me to be so very prominent in these pages,” he writes, but he's not so worried as to avoid all self-aggrandizing. In passing, he humble brags several times about working on a film with Steven Spielberg and Peter Jackson. He also takes a mild—but cheap—shot at Stieg Larsson, another writer of thrillers whose journalist protagonist helps solve murders. On the plus side, Horowitz is informative on behind-the-scenes, surreal atmospherics of what it is like to be the writer on the set of a TV series he has created out of whole cloth. Both his agent and his editor make appearances. Near the novel’s climax, Horowitz grows frustrated with his role of Hawthorne’s Dr. Watson and attempts to solve the case himself. “I have allowed myself to become a silent partner, a minor character in my own book,” the character complains. Yet when he acts on his own, the result is disaster. As a creator of compelling crime fiction, Horowitz is what is known as a civilian, an outsider who relies on imagination and research. He brings no special expertise derived from spending time as a homicide detective (Joseph Wambaugh), a criminal attorney (Linda Fairstein), a mental health practitioner (Jonathan Kellerman), or even a cop reporter (Michael Connelly). In fact, Horowitz had his first success as the author of several thriller and spy series for young readers, including “Alex Rider” and “The Diamond Brothers.” Yet he seems to have an instinctive sense of how and why people commit murder, and how they are caught. Or at least a version that resonates with crime fiction consumers. A member of the Royal Society of Literature Fellows, he has been tapped by the estates of Arthur Conan Doyle and Ian Fleming to write new vehicles for icons Sherlock Holmes and James Bond. He’s also written for television: Foyle’s War and Midsomer Murders, both of which he also created, and Agatha Christie’s Poirot. His 2018 mystery, Magpie Murders, like The Word is Murder, took a similarly meta approach to the story, dissecting the publishing industry, especially crime fiction, along the way. The Word Is Murder is based on an interesting narrative conceit, but one that's largely farfetched, bordering on fantasy. Although a staple of movies, mysteries, and TV, in real life writers rarely help solve murders—the recent profusion of Serial-like podcasts notwithstanding. For a writer, literally solving a premeditated killing is quite different than literarily working out a solution. That can be tough, especially when the details and the outcome of a case are not neat, and tied off with a ribbon. I know this as someone who has done it in real life—twice now—when researching crime books. In my latest outing I was, like Horowitz, invited by law enforcement to participate in such a homicide investigation. Take it from me: The view from the inside is quite revealing—and humbling.